Notes: This is a guest post from Evelyn Nichols M.Ed of Mighty Bambinis and explains the reasoning behind the questions found in the YPM Preschool Visit Checklist, which you can download and take with you on preschool tours – it’s relevant for children ages ~1-5. It’s preschool school admission season! A stressful time for many parents, especially where I live in San Francisco, where it seems as hard to get into childcare as it is to get into Stanford. As an early childhood educator and mom of preschool-aged kids myself, I have put a lot of thought into how I assess quality in early childhood programs, and now I am going through it again as a prospective Kindergarten parent in the San Francisco public school lottery. It seems easy enough, right? It’s just preschool after all; does it really matter whether the child attends a Reggio Emilia, Montessori, or Waldorf-based program? But as I’ve learned since becoming a parent, seemingly small decisions seem to carry with them the weight of deciding what our values are as a family, and how both large and small decisions convey and pursue those family values. Preschool and childcare are certainly one of these crossroads. It’s where our children have their first relationships and experiences away from the cocoon of family and home. Firm, loving limits, predictable and realistic expectations: young children thrive with predictability and firm boundaries, but lots of freedom and agency within those limits. Even newborns/young infants should be spoken to as whole competent people, and invited to participate and help themselves. Children really flourish when they feel known by their caregivers/teachers and when their teachers focus on what they CAN do, above what they can’t yet do. Do teachers tell children what they will do to them before or during caregiving routines, transitions and during play? What do teacher do and say when a child is struggling to get a play object out of reach of an infant? What do teachers do and say when two children want the same toy? What do teachers do and say when one child is having a long turn and doesn’t want to share? What do teachers do and say when a child has hurt another child or property? Look for “floor time” – when caregivers are on the floor with children observing or playing. Look for eye contact at or below child’s level when speaking. Look for caregivers talking to children as another human, announcing what will happen, giving children time to respond, and involving children. What are your impressions of the caregiver’s attitude, communication skills, management of difficult situations, etc.? Are the children treated with respect? What interventions did you see when children: cried, separated from family, were aggressive, got frustrated, and struggled during transitions? I think this is where families have to do some soul searching. There are many pedagogical philosophies that all have their merits, and at the end of the day much of the decision about which school to send your child to will come down to availability and logistics (cost, proximity to work and home, ages served, etc.) So I advise touring and “feeling” out preschools on a gut level; you have to choose a preschool that you can fit into your life without making yourself so stressed out with the commute or cost. However, as you have heard on the Your Parenting Mojo podcast there is a lot of research that indicates that play in the early childhood settings is the best way for young children to learn – so my preference is always a program that has a healthy dose of free, uninterrupted play. Many parents want to see teachers engaging, entertaining, and interacting constantly, but giving children time and space to explore, experiment, negotiate with peers, and lead their own play required teachers taking a more observational and quiet role that parents necessarily know to appreciate. Some things I personally look for are when teachers refrains from telling children to be careful or deliver quick, neat and tidy verdicts or solutions for children who are struggling. I would prefer to see teachers bring their calm attention and allow children freedom of movement, real choices, and time to learn how to negotiate social, physical and cognitive challenges mostly on their own so they can have their own sense of accomplishment, learn to assess risks, and appreciate that mistakes are a healthy part of learning. What is the curriculum/philosophy of the program? What chunks of time are children able to play uninterrupted? How do teachers engage children during play? Are there opportunities for observation/intentional selective (reduced) interventions? What is the stance on clean up, sharing, and discipline? What opportunities for real choice do children have? Are children allowed to select their own play objects and can they play as long as they like with those objects? How many transitions and adult-directed activities are there? As most parents can understand, transitions are some of the most conflict-ridden and difficult times to navigate. Simplicity, having a child-paced (slow) rhythm, and lots of predictability in routines help to smooth out the day. Many parents wonder how teachers can get a room full of kids to participate cooperatively in clean up, setting tables, bussing their own meals, and go willingly to the toilet at school. It almost never looks like a well-choreographed ballet in the classroom, but quality programs have spent time building classroom rhythms, routines and rituals so that children know what is expected and that they are valued, needed members of the community. Their schedule may seem boring to adults, but I can tell you the children in my program felt great comfort, excitement, and confidence the more routine our days and weeks were. For example, we always gardened on Tuesday in preparation for the children cooking soup on Wednesday morning, to have soup and bread for lunch. We sang the same songs at clean up and focused on it as not just a time to rush through, but a meaningful time full of learning and community building. What is the schedule/rhythm of the day? What rituals are there for greeting, clean up, eating, sleeping, etc? What happens when a child is not done with something they are working on but it is time for a transition? How much time do they get to spend outside? How many children are outside at once? What do they do outside? Do the children seem engaged in play independently and cooperatively? The environment of an early childhood program can help or hinder children’s and teachers’ experiences. Well-designed environments invite and direct children’s attention, reduce conflict, and “tell” children how many people can be in a given area at one time. Environments should be filled with passive (not battery operated), open-ended play objects, materials accessible to children without adult help, limit overstimulation (neutral colors, sound reducing, clutter free), and be developmentally appropriate. Program environments for toddlers and preschoolers typically have defined areas such as dramatic play, library, quiet area, sensory/art/science, gross motor, construction, group/open space. Classrooms and outdoor areas should be safe, yet challenging. Tell me about how children interact in each of the classroom areas? How many kids tend to play there? How do they interact with the materials, each other and the teachers? What ways do teachers encourage play? If you were your child over the next two to three years would you want to spend large amounts of time in this environment? Is it safe, yet challenging? Does it focus children’s attention and invite them to explore? Two structural mechanism that helps teachers/caregivers deeply know children in the program is a commitment to continuity of care and primary care assignments. Even if they don’t use these terms, continuity of care means having the same caregivers/teacher and children together for as long as possibly, ideally 3 years. And primary caregiving means that caregivers/teachers are assigned a cohort of children that they develop a deeper bond with and they have primary responsibility over doing routine caregiving such as meal times, potty/diapering, sleep, and separation. My preference is to have my kids in programs that are mixed-age or where a teacher loops and moves with them from room to room with the same cohort of kids. Many schools have children move to a new classroom and teacher when they reach certain ages, but for young children learning is optimal in a setting when children feel securely attached to significant adults. How long have your teachers been in your center/childcare? How long will children stay with each caregiver/teacher? When will they switch rooms? When they do, do the children and teachers stay together? Does this setting (teacher + environment) seem to meet the needs of my child for 2 to 3 years? Does this setting meet our family’s logistical needs/situation for 2-3 years – price, location, commute? When programs use primary caregiving a natural result is a focus on each child as a unique individual. It takes observation and time for a teacher to know a child and develop a trusting relationship. Following children’s unique rhythms and styles promotes well-being and a healthy sense of self. When a child feels understood they experience less stress, remain self-regulated, and use cues that are subtle rather than exaggerated to get the caregivers attention. When they feel secure in the relationships they can now go onto tackle larger cognitive, social, and physical challenges. When caregivers focus on an individual child they often feel more connected and rewarded in their work. Do the teachers/caregivers have assigned children that they care for during routine caregiving (eating/feeding, sleeping, diapering, toileting, getting dressed, greeting/separation, soothing)? How many caregivers are assigned to each child? How many adults interact with the child to perform routine caregiving? Do the children know which teacher to go to for help? Do they get passed around from adult to adult? Small group size and good child:teacher ratios tend key components of quality care (although the other factors in this article may be at least as important). The Program for Infant/Toddler Care recommends primary care ratios of one teacher to every three or four children, in groups of 6-12 children, depending on the age. The guiding principle is: the younger the child, the smaller the group. Small groups facilitate the provision of personalized care that infants and toddlers need, supporting peaceful exchanges, freedom and safety to move and explore, and the development of intimate relationships. For older children (3-6 years old), a group of four to eight children per teacher can work well. The total group size that works for your child will depend largely on your child’s temperament, their (over)stimulation in a large, noisy, busy environment and the design of the environment. For example, most co-ops have a large groups with many adults and children. This may work well for some children (and adults) and not so well for others. Personally, I chose a smaller home-based 12-child Waldorf preschool for my daughter who I felt thrived in a smaller, less noisy, more intimate and predictable setting. She cares deeply about forming relationships, telling stories, being heard and has some sensitivities to loud noises and being “too close” to too many people. For my son, who loves loud noises, hustle and bustle, and prefers anyone who will play with him while digging holes and playing trucks, we’re starting him in a large co-op soon with around 35 children, 5 teachers and 5 parents in the room at one time. How many children and adults are in the room at one time? What ages are enrolled and how are they grouped by primary care group or room? How do the teachers communicate about their charges in between shifts? If many children and adults are in one room, what efforts (physical environment, time usage, or are taken to reduce overstimulation and create a sense of intimacy and small groups? Do teachers spend a lot of time talking to each other? Or do they spend more time observing children and interacting/responding to children? A strong, collaborative, respectful relationship between caregivers and parents is extremely important for children, especially in their earliest years. Parents should generally be seen as the experts on their child. Parents and caregivers can share insights and observations, struggles and exciting developments. It’s important to choose a caregiver that you can trust to be honest, communicate with about the good and bad, and work together with to problem solve. Caregivers and parents should see each other as partners! How and when do they communicate with parents? What do they do when a child is injured (large or small) at school? It is much easier to get children into childcare / preschool after 24 months of age, due to licensing rules about ratios based on age. 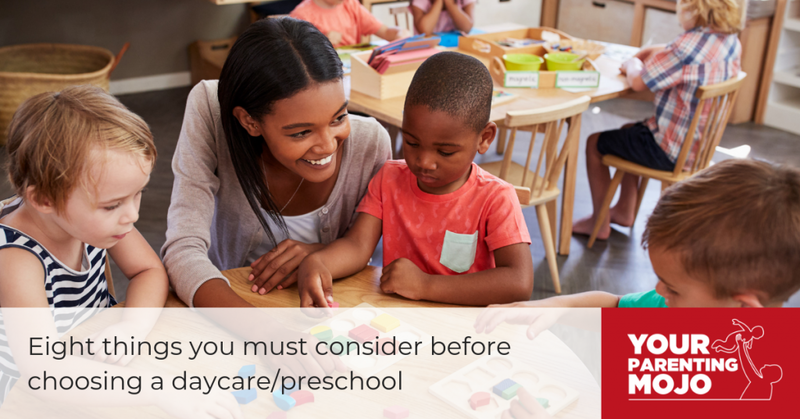 In general, it is easiest to get into childcare around August because that is when children graduate on to preschool or if you are flexible and can take immediate openings mid-year. And lastly, don’t give in to the total panic all around you among parents making this decision. Most children adapt well to preschool within a month, and if the transition is difficult most teachers and administrators will be happy to work with you. Ultimately this doesn’t have to be a one-and-done decision: some parents do end up moving their child to another setting and find a better fit – and the child is no worse for wear. Evelyn has a Masters in Education, several teaching credentials, served director of a large alternative private school, ran her own family childcare at her home in San Francisco, and has mentored many new childcare directors through Wonderschool. She lives with her family in San Francisco, teaches parent-child classes, and trains nannies and teachers virtually and in person in groups and individually. You got me when you said that you can be sure that your child will receive quality care if you will choose a preschool that has a small group size. My husband and I are planning to find a faith-based school for our son. We want to make sure that he will receive adequate attention to all his needs. Additionally, we want to strengthen his faith before choosing a college school because he can easily be distracted by negative thoughts. Thanks for sharing this. Thanks for the comment, Sharon. To be clear, small group size is especially important for the youngest children as they are developing language as they need frequent opportunities to interact with caring adults to do this. The link between group size and child outcomes is rather less clear in the preschool years – intuitively it seems that smaller group sizes should be preferable at all ages, but the research hasn’t definitively shown that small group sizes in preschool are tightly linked to child outcomes.